Scientists have been studying climate change since the 19th century. Over the years scientists have worked to predict how climate change may affect hurricanes, droughts, floods, blizzards and other severe weather, but one area that has been overlooked is mild weather until now. In January, NOAA and Princeton University scientists produced the first global analysis of how climate change may affect the frequency and location of mild weather days. For the purpose of the predictions scientists define mild weather days as temperatures between 64 and 86 degrees F, with less than a half inch of rain and dew points below 68 degrees F, indicative of low humidity. mild weather a year by the end of the century. These are also areas where NOAA and partner research shows economic damages due to climate change. The loss of mild weather days, especially during summer, when they can serve to break up extended heatwaves, also could significantly affect public health,” said the NOAA press release. Those who live in the mid-latitudes, including most of the United States, as well as many mountainous areas around the world, will gain mild weather days on average. Communities along the border with Canada in the Northeast, Midwest and Northwest, as well as many parts of Canada will be the big winners. 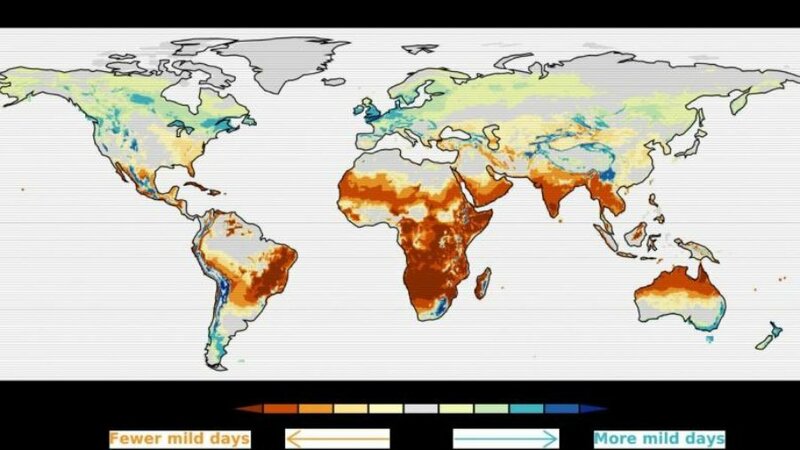 Additional areas projected to gain as much as 10 to 15 days more annually of mild weather by the end of the 21st century include parts of England and northern Europe, and Patagonia in extreme southern South America. New NOAA research using climate models shows a change is coming to the number of mild weather days for major cities in the United States. Chicago will lose 9 days, Miami will lose 28 days, New York City will lose 6 days and Seattle will gain 9 days.